Lothian Thistle Hutchison Vale are one win away from retaining their Central Taxis Premier League title after a 4-2 win over Stirling University in their penultimate fixture. Stirling fielded six of their Lowland League players against the Saughton outfit, but goals from Scott Moffat, Callum Connolly, Darren Smith and Connor McGregor did the business for the Capital side. It sets up a final day clash for Lothian with Leith Athletic, where even a draw may be enough for the reigning champions if Easthouses Lily fail to take maximum points from their final two games against Craigroyston and Spartans EOS. “We knew it was going to be a hard game, but the lads took their goals really well and Darren Smith’s free-kick was probably one of the best goals of the season,” said Raymond Carr. Lothian face Whitehill Welfare in the Third Round of The Image Printers Cup next Saturday, before their final league match against Leith at Meadowbank the following weekend. “The final game against Leith is one to relish, but both they and Easthouses have league games to play before then, so they both control their own destiny as well,” added Carr. Easthouses Lily remain in touch with Lothian after their 3-1 win at Civil Service Strollers thanks to goals from Darren Robertson, Ally Elliot and Mark Brown with Mark Pagliarulo netting for Civil. Victory for Lily over Craigroyston tomorrow night (7.30 kick-off) at Newbattle would put Dave McQueenie’s side on level points with Lothian before they conclude a superb season with a trip to Spartans EOS next Saturday, albeit they would need a significant goal swing to win the league. 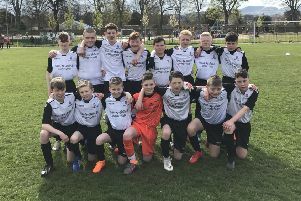 Tynecastle put a severe dent in Leith Athletic’s title bid with a 1-1 draw at Fernieside, with Derek Riddel’s side needing maximum points from their final two games of the season to keep their fading hopes alive. Keith Murray took his goal tally for the season to 30 with the opening goal on 10 minutes, but Tony Muir levelled for Tynecastle five minutes into the second half. Spartans EOS were 2-1 victors at Coldstream, a result that consigned the Border side to the First Division. Scott Clapperton and Davy Stewart were on target for Alex Cunningham’s side. Spartans EOS face Tynecastle at Fernieside tonight (7.15 kick-off).